I’d met him in passing after arriving late to a Kraftwerk show. I remember chatting with him, but didn’t necessarily feel we’d had a moment. (Granted, it was dark and my judgment may have been clouded from happy hour.) It was loud in there, so I’d introduced myself as “Paula, like Abdul.” And then he was gone. A few days later, when I saw the listing, I gasped. Since Missed Connections launched in September of 2000, the lovelorn have sent out hundreds of thousands of postings seeking someone who got away. As a 2013 study showed, the places where Missed Connections happen vary wildly by state: In the midwest, the supermarket is a prime locale for an encounter, while Walmart the top place for unresolved attraction in the south. Fifty-nine percent of postings were men seeking women, more than doubling the 27% from men seeking men. Thirteen percent were women seeking men, and just 1% from women seeking women. Amidst the barrage of A/S/L queries one can find fantastic reading material, moments—many of them sweet, profound and earnest—that feel a little like peering through someone’s crush diary. Sparks can fly anywhere: At bars and at hardware stores, while sharing an umbrella on a rainy day and after a mediocre thumb war that demands a rematch. Where else can you get such a range of voices—not limited to 140 characters—detailing everything from the nurse technician who said “nice veins” to someone while drawing blood, to an invitation from a “fellow weirdo” to sit alone, together, at dive bars? Calls for “French doctors from Brooklyn who liked Box Trolls” and the person who “punched me in the face on the M”? Other postings are downright strange. Some are blatant jokes and a handful are straight-up disturbing. A generous subsection of Missed Connections are pure digital performance art, a sounding board for poets and word experimenters. And some—attempts to find someone after many years away, or trying to snag someone’s number after a clandestine hookup—are the ultimate shots in the dark. After a week, the writer has the option to repost their Missed Connection or let it fade away. That’s it. The formula is no-frills, the possibilities abundant. As for my Missed Connection, I wrote him back and we went on a date for burgers and beer. We didn’t hit it off and it was awkward at first, but I had a nice time. It wasn’t any weirder than the left-and-right swiping I was doing on Tinder, or the occasional forays into my OkCupid inbox. In fact, it was perhaps less strange than a typical internet blind date, because we’d actually met and spoken to each other before we went out. Others get more lucky— like Chris Sykora, a Chicago resident who married his Missed Connection. He’d been orbiting Chelka Posladek, his now-wife, for years without knowing it: they both lived in Kansas City for awhile, and she frequented the grocery store where he worked. Coincidentally, they both moved to Chicago the same month and she began dropping by the diner where he worked in Boystown. They never exchanged numbers, and never quite had the chance to properly meet. He still worked at the diner, but different hours and the two hadn’t been running into each other. Then, on New Year’s Eve in 2007, Posladek—armed with some liquid courage—took action. “I was super drunk and was like, ‘I’m never gonna see that guy again!’” she says. “And I didn’t know how to find [him], so I wrote a Missed Connection.” A friend of Sykora’s saw the post, which mentioned the diner and the blue whale tattoo on his forearm. The rest is the stuff of urban legend: they married in 2010 and are currently expecting their second child together. Of course, Sykora and Posladek’s story is an anomaly, especially for Missed Connections. Like any other first date, a Missed Connections encounter can be just plain bad. Luis Paez-Pumar, the 28-year-old sports editor at Remezcla, says: “I had one written about me and I actually went through with texting and meeting up. It went… poorly.” Paez-Pumar met his missed connection at a concert, and after chatting with them for 15 minutes, had to leave. He was curious, and later went on Missed Connections and saw himself there (“tall dude wearing Screaming Females shirt). Eventually they ended up meeting, and, after she wondered aloud why he was out with her because “it sure seems like you’re gay,” she went in for a kiss, much to his surprise. “It was also the last missed connection I ever even searched for,” Paez-Pumar laughs. Others, as detailed in a particularly harrowing New York Times Modern Love story, use Missed Connections not to find a particular person but by posting generally about appearance and place in the hopes of finding someone who fits their type and, perhaps, thinks they’ve already looked longingly at one another. So many tricky factors are at play in this forum—which, perhaps, is part of its appeal. You have to have an encounter with a stranger that’s distinctive enough to recognize in the dozens of daily posts. Your alluring stranger also needs to be scrolling through the site—and then they need to have the guts or interest to respond. Still, if you do find each other, there’s the ultimate satisfaction of knowing that it’s still possible for people to connect in real life and then take it online, not the other way around. The woman did see his post—and they ended up going out on a couple of dates. Still, the chance of missing your Missed Connection is high. As many of my friends and colleagues concede, “Maybe I’ve had one written about me before, but I never saw it. How would I know?” Sometimes a friend will see the posting and pass it along, as was the case with Sykora and also with Jane Bruce, a freelance photographer who moved to New York six years ago. 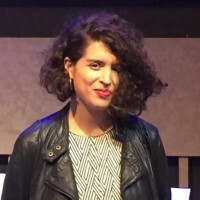 After a night out in 2011 with her pals at the now-shuttered Cameo Gallery in Brooklyn, a friend told her that someone had posted a Missed Connection for her. While she hadn’t noticed the man that night, she emailed him and they went out several times. Of course, people can be shy, especially around a stranger they don’t know and find attractive. But Missed Connections is also the ultimate embodiment of l’esprit de l’escalier, the French phrase describing the peculiar phenomenon of thinking about the perfect thing to say once you’ve already left the room (or, literally, ascended the staircase). What makes the forum special is a reminder that loneliness is a shared experience, that each of us wants someone special to pass time with, even if it’s the stranger on the next train seat. And that each of us may be the stranger in the next train seat to someone else. I’ve written two unsuccessful Missed Connections in the past several years: “Saturday night, Andrew at Sing Sing Ave A” and “Cute guy with bucket on the F Train”. I got some incredible responses to those postings, even though neither reached the guy I was looking for (shoutout to the guy who wrote to me saying “such an awesome post I hope he connects with you good luck” and “Jon,” who emailed me asking “Do I need to take the subway and walk around with a bucket to get a woman’s attention?”).. I’m not deterred. I’m still reading the Missed Connections, and ready to post again if and when a moment presents itself. Oh, and if you happen to see this, Andrew and Bucket Guy—drop me a line, will you?